I’ve decided something… I really don’t like the word “celebrities”. Not conceptually, mind you, but the actual letter structure of the word – it’s just weird. Anyway, I wanted to talk a little about the celebs of the WoW community. Individual servers often have their famous or infamous types. The servers I’ve been on have the people that are known because of their progression, the high-end raiders, but that’s usually the guild tag. Those who are really known are the trolls. We had player who went by Skillasaurus(spelling may be off). He always talked in all caps like he was a barbarian and said ridiculous statements, such as, “SKILLASAURUS NO AFRAD OF STOOPID GM. SKILLASAURUS ONE SHOT GM.” It was actually somewhat entertaining how he never broke character or said anything that was actually inappropriate, but still got trade chat in a fuss everytime with people legitimately trying to argue with him. He even got people to create similar named copycat characters to bathe in the spotlight. There are those, however, that exceed local server fame and are followed by thousands if not millions. Who? How? Why? The easiest (I use this term loosely) way to gain renown in WoW or other gaming environments is to simply be the best. Method, Paragon and Blood Legion are fairly known to the raiding communities as usually being the among the top few racing for world first boss kills. Their members tend to have default popularity and are able to generate high viewers for Twitch streams and such based on their status – people want to watch how the best of the best do what they do. This is particularly applicable for high-end PVPers. While not as popular as PVE in general, the individual players are able to get dramatically more attention for being particularly good – especially if they capture and post their exploits. A prime example of this category would be Swifty. He’s been posting youtube videos of his amazing warrior accomplishments for the majority of the time WoW has been alive. A good friend of mine who got me into WoW has been following him since at least 2008 and when new big warrior changes happens, he heads to Swifty’s videos and stream to check on how warriors should be adapting. Hell, in my PVP guild even not warriors still refer to a huge macro with all of your CDs packed in for crazy burst as a “Swifty Macro” because he either pioneered or was first known for such a thing. As such, just on youtube he has nearly 600,000 subscribers and 120+ MILLION views. Socialblade.com which ranks and estimates income of youtubers says he earns between $800-$8000 per month on the site. While being the best is a great way to get popular, some people rise to their relative fame through other means. Nearly ever WoW player is familiar with LEEROOYY JENKINS. Some players made up an in-game video of one persons ridiculous and hilarious behavior. What I believe to be the original video has 37 million views and landed that player an in-game title (Jenkins). As I hear that player was also flown to Blizzcon one year to say his famous catch phrase in person for everyone to see. For him, that seems to be the end of the story. Some, take their unusual exploits and continue to capitalize on the popularity. One great example of this is the Sodapoppin. People follow Swifty because of his skill, guilds, informative videos, and giveaways. Soda, however, is like watching a hillarious train-wreck of awesome. He is very skilled in the game, particularly in duels and 2v2 on his feral druid – but that’s the extent of where he goes (at least what he shows and prefers to do). However, he is strange, cocky (kind of a douche), and energetic. The half dozen or so times I’ve seen his Twitch stream he usually has over 10,000 people watching him at any given time. This, I’m slightly ashamed to say I understand. Normally I couldn’t picture myself watching someone play a game I could just play myself, but he’s really entertaining. The area that baffles me though, is how much money he gets for doing this. His youtube popularity is similar to Swifty. However, the crazy amount of Twitch subscribers he gets (which he gets paid for) and the insane (no I’m serious, it’s insane) donations people drop to him. He’s been given tens of thousands of dollars for pretty much no reason as far as I can tell. The video at the top of this post is him getting 200 subscribers in 30 minutes which is worth over $500. I’m not entirely sure what the point of this post was. Maybe to provide some tips as to how to get some notoriety. Maybe to just express my wonderment man’s tendency to create royalty even in the silliest places. Maybe to put some handy search terms for my own blogs popularity. Who knows. But, what I do know, is that I’d like to see your thoughts. Who do you follow? Why? How did you find them? 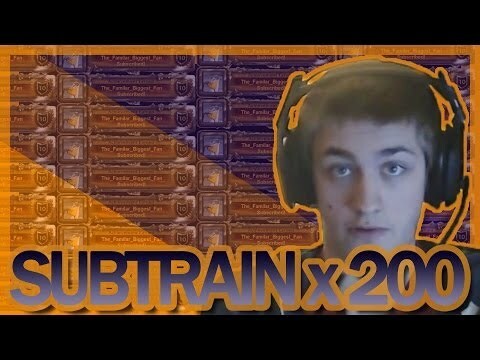 This entry was posted in random, Streaming & Videos and tagged 200 subs in 30 minutes, 200 subscribers in 30 minutes, blood legion, druid, feral druid, jenkins, leroy jenkins, method, paragon, pvp, raiding, socialblade, sodapoppin, sodapoppin twitch, sodapoppin youtube, stream, streaming, subscribers, swifty, swifty pvp, swifty twitch, swifty warrior, swifty youtube, twitch, videos, viewers, views, warcraft, warrior, world of warcraft, wow, wow twitch, youtube. Bookmark the permalink.